My old Nikon D810 has now taken a bit over 200,000 exposures, and I have had to replace both the rubber grip and the shutter. It still works and takes great pictures, but it was getting worn out from the heavy use, so I decided to upgrade to the new Nikon D850. The new camera has a higher resolution sensor, higher fps and higher video recording resolution, but the main selling point for me was the improved auto-focus. For my first photoshoot with the new camera we did a bit of light painting, and it was amazing to see the camera lock on focus without any problem in low-light conditions. One thing that I started to suspect when reviewing the photos on my computer, and that I kept seeing in the photos from my second photoshoot was that the camera would focus slightly in front of the subject. 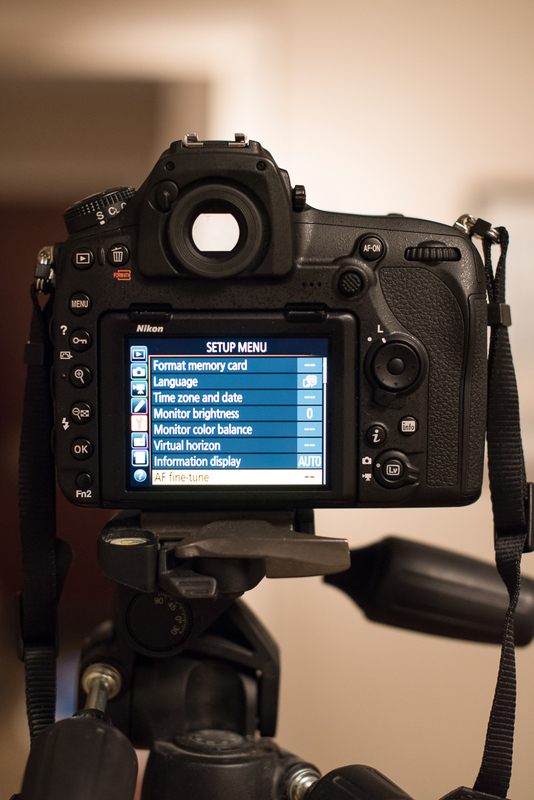 With a high resolution sensor it is increasingly important that you nail focus. Tonight I did some tests, photographing books in my bookshelf at home, and the auto-focus on the camera kept missing the focus slightly. 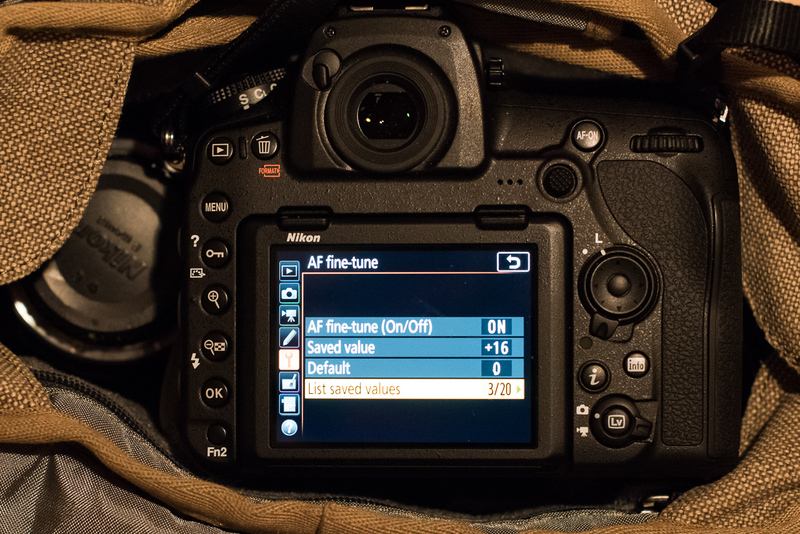 I never had this problem with my old Nikon D810, but luckily there is an AF fine-tune option in the menu that lets you adjust the auto-focus. There is an option in the Setup Menu to activate the AF fine-tuning. To do the fine-tuning you need a good focusing target. I started with a book but found it worked poorly, so instead I printed out a focusing sheet from this tutorial and taped it to my doorframe. It is important that your target is photographed head on, and that you set your aperture to its maximal value, e.g. f/1.4. Switch to live-view and zoom in on the picture to make sure you get the focusing sheet in focus. 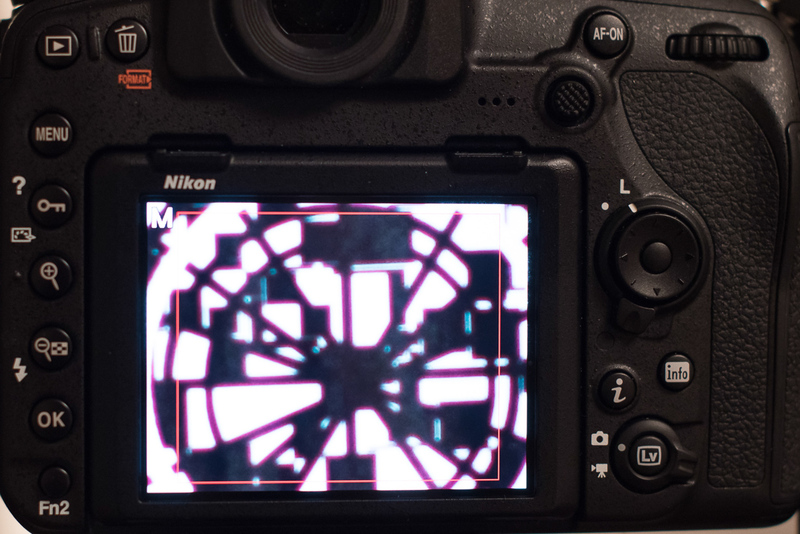 You then press the AF-mode button and the Movie Record button simultaneously for a few seconds (Nikon D850 manual). This brings up a display which asks you if the camera is focused, and when you press yes, it performs the AF tuning. There are two ways your camera can focus. In live-view the camera uses contrast detection, which requires no calibration, as it uses the data on the sensor. However, when you focus while looking through the view finder the camera has a separate circuitry that auto-focuses using phase detection. If this second system is misaligned relatively to the sensor, then you will need to use AF fine-tune. There is an option where you can set your camera to auto-focus in live-view when you touch the screen. This uses contrast detection, so it can be used to set the focus before you activate the phase detection AF fine-tuning. I am still not used to having a touch screen on my camera. It took a while before I thought of this, so most of my fine tuning was done manually. The focus rings on my Sigma ART lenses were quite sensitive, so I also experimented with fine-tuning the focus by moving the tripod back and forth. I found that if the black and white picture got red edges I needed to move away from the wall, and if it got greenish edges then I had to get closer to get the picture in focus.The fine-tune value suggested by the camera fluctuates a bit, so it is a good idea to perform a few calibrations, and then take the average value. Keep an eye out for outliers which might corrupt your results. You then have to repeat the procedure for all your lenses, and the camera will keep track of the fine-tuning values for each one of them. In my case the mean value for the different lenses fluctuated between +16 and +17, so in addition to setting the individual lenses values I also updated the default value to 16. If all your lenses have about the same correction value, then it could be a good idea to set it as your default value for the AF fine-tuning. This photo was taken just before I realised that, and set my default value to +16. This seemed to fix the problem when I was testing the camera at home, so hopefully missed focus should be a thing of the past now. Huh. Funkade autojusteringen för Sigma-objektivet alltså? Jag trodde att den bara funkade för Nikons egna objektiv (det är vad de sagt, men det är klart, they would) så eftersom jag nästan bara har tredjepartsobjektiv har jag inte brytt mig om den funktionen. Just för Sigma Art skulle jag gissat att Sigmas USB-docka var ett bättre alternativ eftersom man då kan justera för olika avstånd. Har jag för mig i alla fall. Men det är klart, då kalibrerar man om själva objektivet och det kanske man inte vill i alla lägen. Ja, det funkade med Sigma objektiven också. Hade inga problem med gamla kameran, och alla objektiv jag testat nu (både Nikon och Sigma) har haft i stort sett samma korrektionsfaktor, så rätt säker på att det beror på nya kameran.